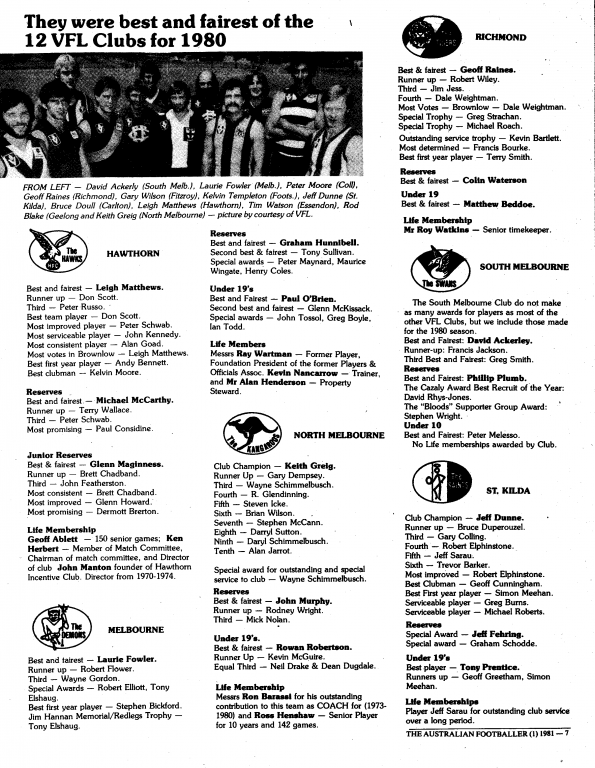 1980 VFL Club Award Winners: Who Can You Spot? The “Official magazine of the Junior Football Council of Victoria” wasn’t familiar to me until some recent antique store trawls. This one cost me $2 and was the opening edition for the 1981 season. 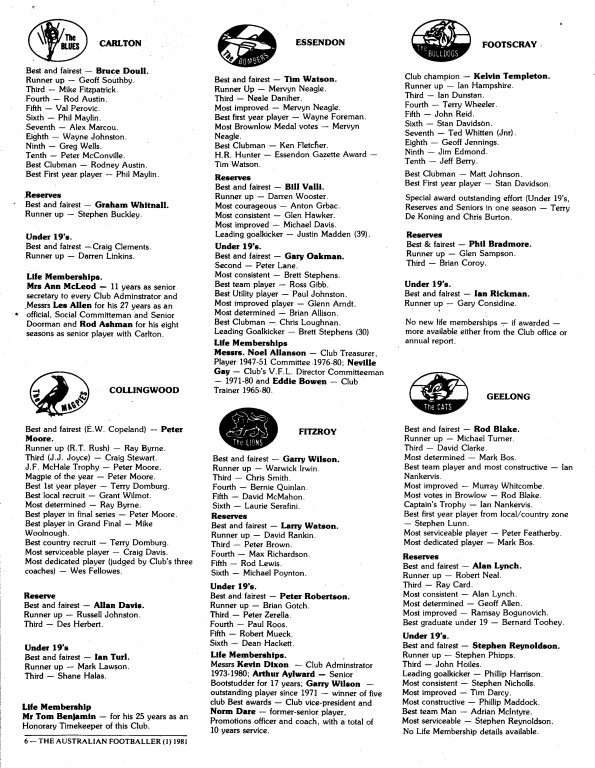 The pages shown below may represent the only place that the 1980 season award winners for each of the twelve VFL clubs was recorded, down to Under 19’s (or in the case of South Melbourne, the Under 10 (sic)). Adding to the roll call of famous and lesser known names is the selection of club logos on display, some of which look less than official, or even graphic. Whatever happened to young Dermott Brerton from the Hawks Junior Reserves? Why were Greg Burns and Michael Roberts both deemed to be a “Serviceable Player”? Does Peter Zerella still get some mileage down at the local for edging Paul Roos out of the placings in the Lions thirds? What about those long-serving volunteers? Who else can you spot from your team or town? Let us know below. Looking at the Geelong side i barracked for in those days, a few names come up that intrigue me. Withe the magoos Alan Dizzy Lynch, got the B&F ahead of two club stalwarts, Robert “Scratcher” Neal and Ray Card. I can’t recall Dizzy having much impact at Geelong, i’m sure he went elsewhere. Ramsay Bogunovich, the young ruckmen from WA was the most improved for the magoos. He had big wraps, but only played a handful of senior games before returning to WA. In the under 19’2 names like Steven Reynoldson, the kid from Strathmerton who got John Newman’s Number 17 jumper, then ended up at Brisbane, Tim Darcy, Phil Harrison, Steve Nicholls,, all had time in the seniors, TD the best of that bunch. Looking elsewhere names i’d long forgotten like Stan Davidson, Greg Smith, Michael Poynton and Bill Valli, for example, bring back long forgotten memories. Keep up the good work Mark, it’s appreciated. What I picked up on Swish was that two of the B&Fs from other clubs – Kelvin Templeton (F’CRAY) & Laurie Fowler (MELB) – both started their careers at that year’s Premiership team (RICH). And the goal kicking medallists weren’t shown. for instance, at Tigerland it’s the Jack “Skinny” Titus Medal. Carlton Reserves Best & Fairest – Graham Whitnall, father of Lance. Fitzroy Reserves Best & Fairest – Larry Watson, brother of Tim. Hawthorn Junior Reserves Runner Up – Brett Chadband went on to have a reasonable career at Port Melbourne. Melbourne Reserves Special Award – Peter Maynard, father of current Collingwood player Brayden Maynard. Melbourne Reserves Special Award – Henry Coles, built a new fence in my childhood backyard in the early 80’s. South Melbourne U10 B&F Peter Melesso went on to play senior football for South, St Kilda and West Coast. A cancer survivor. His father Neil also played for South. Essendon Under 19’s most consistent & leading goalkicker, Brett Stephens, became a good player at Fitzroy (133 games) & later became Pete Sampras’ personal trainer. Bulldogs Under 19’s B&F Ian ‘Chops’ Rickman became a legendary goalkicker at Williamstown and one of the longest kicks of the footy i’ve ever seen, including Bernie Quinlan. Mr Wrap, i’m perplexed re Kelvin Templeton starting his career @ Richmond. He came down from Gippsland, making his debut for Footscray as a 16, (17?) year old in the R 3 encounter of 19174 when they played Collingwood at Victoria Park. Where does the Richmond link come in? On another note i see Fitzroy warded life membership to former wingman Norm Dare. Didn’t he end up coaching Brisbane for a few games in 1989? Didn’t Jeff Fehring (St Kilda reserves) kick the longest goal of all time in ’81? Strange to note that Terry Wallace was runner-up in the Magoos in ’80 despite being an established senior player prior to this (played in the ’78 Premiership) and immediately after it (won the B&F in ’81). Must have been his season from hell – maybe had a fall out with David Parkin (who left Hawthorn at the end of that year). Strange days indeed (most particular mama). KT was recruited from Traralgon after kicking a ton in the Latrobe Valley League in 1973. He played the first two games of the 1974 season in the reserves prior to making his senior debut at Victoria Park – April 20, 1974. Not sure where this “commenced his VFL career at Richmond” myth started. I’m more than happy to end it. That’s a ripper Swish. 1980 was the first season I started going to the footy just about every week. Memories are quite vivid. Although I didn’t realise that Ray Byrne was runner-up in the BF that year. Super effort from an honest defender. I see Dermie got most promising at Hawthorn as a 15 year old. David Ackerly was our footy coach at Northcote High in 1986. He could play. Interesting reserves b & f winner at North Melbourne: one J Murphy, 5 times best and fairest winner at Fitzroy. Murphy played only 9 games for North in 1979-80. I once had a conversation with him in which I asked him why he went to North. He replied that he went because North wanted him (and Fitzroy didn’t), and that he could not believe the difference in professionalism having come from the battling Lions. Also, one M Nolan was 3rd b & f in North’s reserves. This was his final season at North – he only managed 3 senior games that season. Brian Gotch is listed as Fitzroy U19 Runner Up Best & Fairest. Is it possible this is a typo and was in fact, Brad ? Smokie, John Murphy also played one season and a bit at South Melbourne in between Fitzroy & North & once again won the B&F and was leading goal-kicker as well, perhaps he forgot to mention that. Not sure why he left South, but it coincided with Ian Stewart’s return. Thanks all. Some great stories there. Mark, that probably was Brad Gotch, the dates fit. Probably Brian Cordy in the Footscray magoos. Swish and Greg Smith coached the Roseworhty side aka the farmers so there is well and truly a affinity with the blacks and I am doing a coaching clinic with Tom Fields( he was on Carltons list last year and is back at South so I will get him to send the article to Brad Gotch tomorrow. Jeff Fehring tragically is no longer with us also. This stuff re Templeton being @ Richmond is so far off the mark it’s hard to take seriously. I recall R3 in 1974 listening on the radio to Geelong V Melbourne @ the G.. Geelong got home by 4 points. You blokes pushed the Pies, to a few goals. Did Sandilands kick 6, Templeton 4? Back to this nonsense re Templeton apparently playing for Richmond; NADA ! Greg Smith, he is the bloke who came from Ardlethan to play for the Swans? Templeton got 6 on debut (20/4), Spider Welsh kicked 4, Sandilands 2. McKenna kicked half a dozen and Big Bob Heard 4 for the hosts who won 16.16 to 14.15. The inclusion of former Peckers star Ray Huppatz gave our chances of victory a good kick along. Fair bit of talent made their Doggie debuts in April 1974 – Geoff Jennings, KT, Ted Jnr, the aforementioned Huppatz and Greg Parke from Melbourne. Michael,another chap who made his debut for the tricolours in April 1974 was Darrell Collins. He played in your R1 victory over Geelong @ the Western Oval. Donning the #22 guernsey Daryl played just the one senior game for the Dogs. The jumper had been worn by Robert Rose in his sadly all too brief stint with Footscray during the back half of the 1973 season. Ted Junior would follow Collins into “two little black ducks”. Seven of the players listed above – Tim Watson, Lorenzo Serafini, KT, Michael Turner, Robbie Flower, Schimma and Trevor Barker found time during their busy 1980 schedules to “lend their voices” to the truly execrable “Footy Favourites” album. Sorry people – FF was released 1981. Love that Collingwood had awards for best local recruit and best country recruit. The Geelong logo looks like Tom from ‘Tom and Jerry’. Many great names here Swish. $2 well spent. Very few U/19 Best and Fairest winners who went on to have significant VFL careers. Stephen Reynoldson or Paul OBrien the picks and neither set the world on fire. I guess if you played enough games at under 19 level to win the B and F you weren’t being picked in the reserves ( or even seniors ) and were almost certainly going to finish up being given the Tijuana.